With some effort I can make out the muffled question, asking me how school went. I detect his characteristic playfulness, despite the thick sound of the voice, with soaked gauze covering both nostrils. I stand at the foot of the hospital bed, staring at the tallest Peruvian man I have ever known, his near 6â€™3â€ frame covering all but the corners of the bedsheet. I tease him about it, making a reference to Gulliverâ€™s Travels, and he chuckles a bit. â€œGet Well!â€ cards and four poinsettia plants line the window sill, marking the Christmas that is soon to come. I take a seat next to him, listening as he recounts the visitors heâ€™s had that day, ranging from a former restaurant cook to an Andean folklore musician. The diversity of people who come to see Augusto doesnâ€™t surprise me. 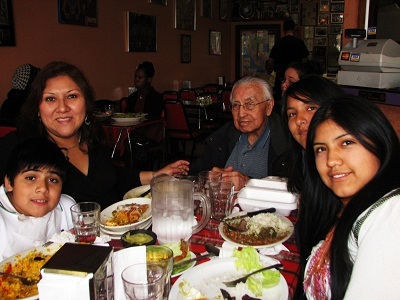 For almost ten years he has worked diligently as a waiter at a Peruvian restaurant owned by his older brother on Chicagoâ€™s North Side. His genuine friendliness, sometimes dry humor, and constant caring for others leave a mark on the many people who sit at his tables as customers and friends.Â Iâ€™ve watched as he recounts specific details; a relative visiting, upcoming birthdays, and not just of me and my friends but of the throngs of people who walk through the restaurant door. Looking back, his caring has been one of the few constants in my familyâ€™s frequent moves and hectic lives. Though a journalist and lawyer in Peru, once arriving in the United States, my mom had to take any job available, in turn affecting what apartments we could afford to rent. Too often this led to irresponsible landlords, whom we were eager to leave after our one-year lease expired. Augusto would come to the rescue. When my momâ€™s car had a flat tire, Augusto took it upon himself to teach me how to fix it, and then offered to show me how to drive though I was not quite fifteen. As I got older and rebelled against everything, his calming yet serious e-mail messages had me reconsider my anger. And as I started college, Augusto moved me into my dorm, the first of many times he would come to Northwestern in his beat-up pickup truck â€“ either to deliver hot Peruvian dishes or help me move yet again. Sitting next to him now, I think about the toll that his strong work ethic has had on him, which might be part of the reason he is now in the ICU â€“ one of the few days he hasnâ€™t gone to work in the last ten years. At fifty-four, those ten years also mark how long itâ€™s been since he last saw his home country, Peru. Like many immigrants, Augusto emigrated to the U.S., looking for opportunities to better provide for his family. Though Augusto is not my dad, heâ€™s been there for me as if he were. I never know quite how to describe our relationship to others. The closest word I can think of is â€œuncle,â€ but even that is not sufficient. What began as a family Sunday dinner at the restaurant turned into a lasting friendship between Augusto and my mom. Both were recent immigrants, reminiscing about the food that couldnâ€™t be found here while navigating new challenges, from Chicago winters to even colder, unapproachable neighbors. Weâ€™ve shared more milestones together than I have with my own dad who lives in Massachusetts. Augustoâ€™s own family is even farther away; in Lima, Peru. With 3,782 miles separating them, theyâ€™ve missed out on important moments together. When his daughter had a baby two years ago, he could not be there because his immigration status would keep him from re-entering the U.S. To this day he still hasnâ€™t seen his grandchild. And now, for much the same reason, he canâ€™t be with his family after having been told he has cancer. I think of how his children might feel, as I watch someone whoâ€™s been a consistent father figure in my life try to be strong for everyone else. Like Augustoâ€™s daughter, I also canâ€™t sit next to my father when he is ill. I hold back tears and crack a fresh ice pack. We keep the jokes going. I tell him about school, and I wonder if he knows itâ€™s people like him that push me forward.